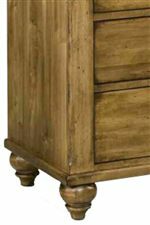 Combining rustic style with the new media age, this traditional styled media chest features a time-worn look with a physically distressed finish over North American maple wood. Clean, simple lines create the case of the piece with an unadorned beauty and a soft country style. Use the seven storage drawers for clothing or media and take advantage of the small door and shelf. Complete with rounded ball feet and antique styled knobs, this decorative chest will bring country styled elegance into your room. 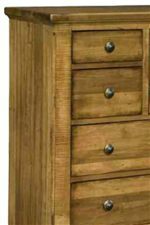 The Hudson Falls Country Home Media Chest with Rustic Furniture Style by Durham at Jordan's Home Furnishings in the New Minas, Halifax, and Canning, Nova Scotia area. Product availability may vary. Contact us for the most current availability on this product. 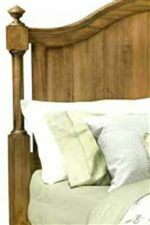 The Hudson Falls collection is a great option if you are looking for Cottage furniture in the New Minas, Halifax, and Canning, Nova Scotia area.